Structure: 2 extendable trays 6-lattice, a handle, a top mirror, a base compartment. 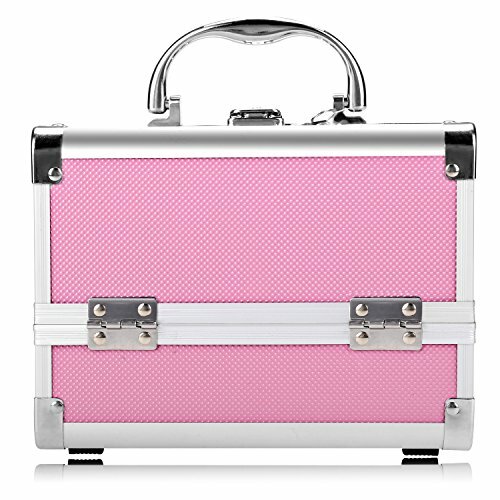 The mini makeup case is Made of aluminum structure with reinforced steel corners, both of the top two Tiers have some small compartments . it helps you to be more organized on your make up .durable. Fleece stuffed, dust-proof and spill-proof interiors for long-term use. Consists of 2 extendable trays 6 lattices, a handle, a top mirror, a base compartment. Versatile, can also be used to store nail art products, UV dryers, brushes, foundations, eye shadows, etc. Designed for personal use, can hold most of your primary makeup and accessories. quipped with Lock and Keys, ensuring your personal items' safety. Mini, Lightweight and Portable, perfect for travel, easy to clean. 【BEST MINI TRAIN CASE】- 3-Tier extendable trays Foldable Cosmetics Case will keep them all neatly organized in one place. It is so great about the small compartments design, so you can custom fit cosmetics of various sizes according to your needs. Ideal for storage makeup Brushes, Nail Polishes, Foundation, Eye Shadow Singles, Lipsticks, etc. If you have any questions about this product by Bazal, contact us by completing and submitting the form below. If you are looking for a specif part number, please include it with your message.